Tilmac grain sheds are a cost effective and versatile method for storing grain. 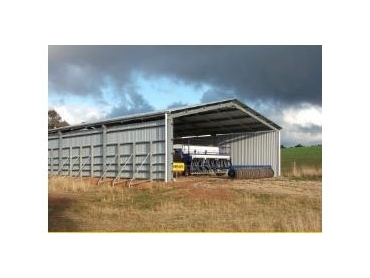 When the sheds are empty they can double as a fertiliser or machinery storage shed. The grain storage sheds have a heavy duty design which has grain chute options for loading and unloading and a capacity from 400 to 20,000 tonnes. Manufactured using a premium quality Australian Steel gives the sheds supreme durability and with 40 years of industrial experience, Tilmac can customise the sheds to suit your needs. With a choice of sizes, designs and options, your shed can be built to guarantee a maximum strength, protection and great looks tool. Tilmac grain sheds come with a 15 year warranty on purlin sheds and 25 year warranty on fabricated frames.